Today we are sailing along the South East part of Yemen and tomorrow we are turning into the Gulf of Aden and from there into the Red Sea. Bab El Mandab should be visible tomorrow afternoon if we continue with this speed. So hopefully we will be able to see the rock formation but it will depend on the traffic which all has to converge there due to the narrowness of the fairway. More about that tomorrow. We are still quite a ways from land and thus there is not very much to see except that the wind picked up during the night and we now have white caps with a wind force 4 (up to 16 knots) sometimes breezing up to 6 (20+ knots). It is a following wind so it does not matter for the ship as the ship is traveling with the same speed as the velocity of the wind and thus it is nearly wind still on deck. The wind is from the North East and has been blowing over warm areas and thus it is a warm wind, making it nice and toasty outside. So today a little bit about the ship. 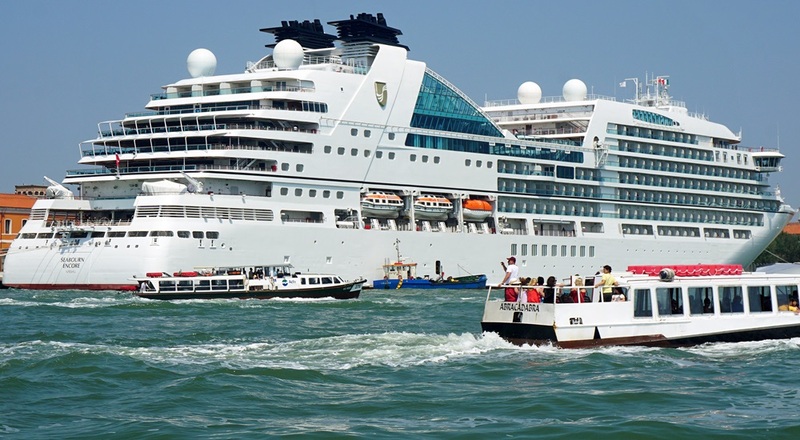 The Seabourn ships are designed according to a concept that came out first with the Europa of 1981; built for Hapag- Lloyd cruises for the German market and was at that time considered the most luxurious cruise ship in the world. She is still around and now sails (until the May 2020) for Saga Cruises of England. 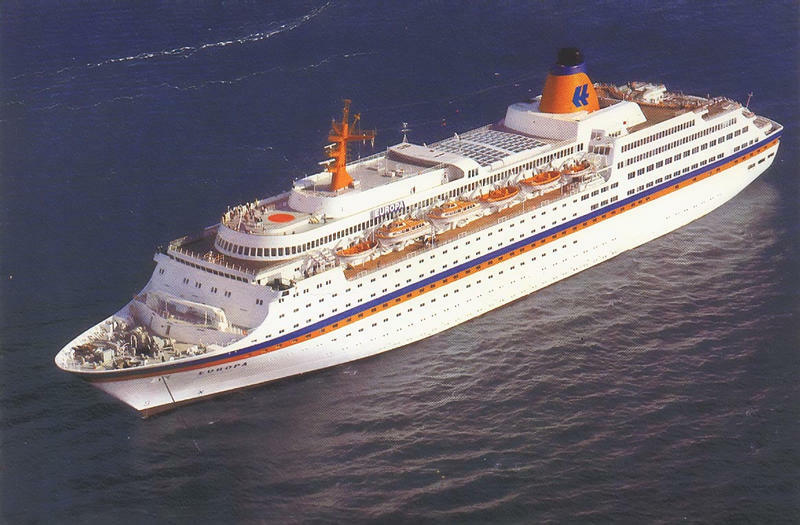 The ms Europa of 1981. Please note the larger windows at the stern indicating the public rooms. What was so revolutionary about her was that nearly all the public rooms were at the stern, where there is the most vibration and nearly all the cabins more forward where it is much more quiet. Thus the public rooms where stacked on top of each other except for the Observation lounge. 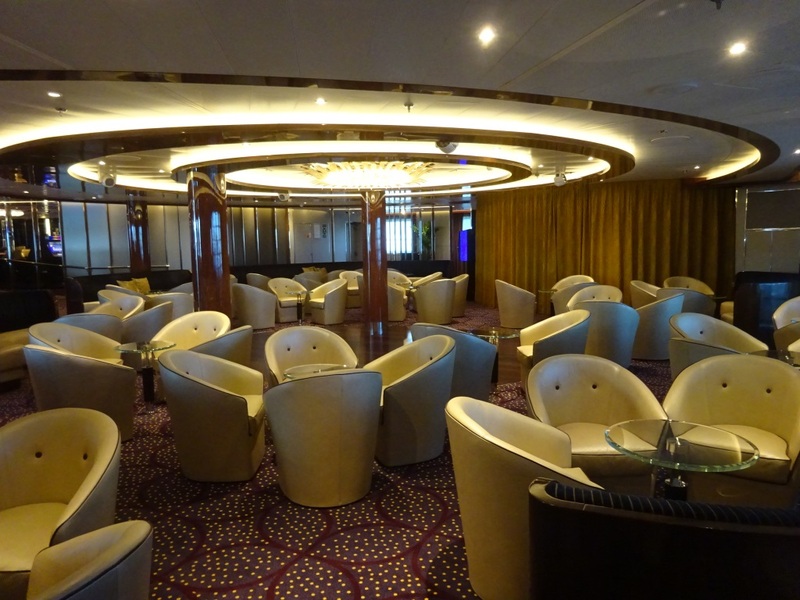 This was a radical change from what was introduced with the beginning of the dedicated cruise industry with such ships as the Rotterdam (V) and then the mass market ships in the 1970’s to have all public rooms in line on one or two decks and the cabins above and/or below. Most cruise ships that are now being built still use this concept. Basically because you can only do vertical stacking when you have smaller numbers of guests on board. The Seabourn Ovation from the stern. Seen here in Venice, very early in her career. At the stern there are only four cabins located on deck 11 right under the communication globes. This is the … The Club especially for pre dinner cocktails with music and after dinner drinks (also with music) It has a dance floor and offers on regular occasions also intimate musical performances. This is the Observatory. Quiet for reading during the day. In the evening there is music, the bar is in full swing and against the back wall a sort of tapas bar with all sorts of snacks. 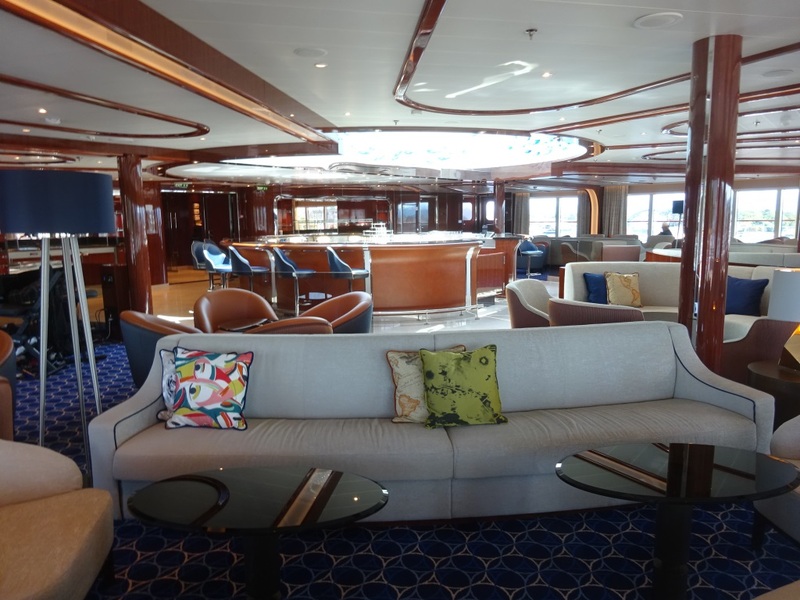 The concept works really well as long as the ship does not cater to too many guests as otherwise these public rooms become too gigantic and then you are better off with spreading them out over two or three whole decks. Tomorrow we will start heading into the Gulf of Aden but I do not expect too much change in weather. It will still be warm but if we come close to the coast then we might see some sand and rocks again. And of course more oil tankers. My son & his wife are on the Prinsendam right now, so I will save this post for them to read when they return. I’m thinking that now they like the smaller ships. Are you coming to the reunion in Stratford ? ?